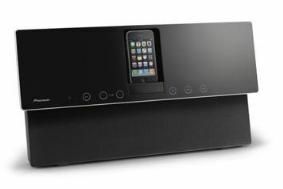 Pioneer launches £199 wall-mounted iPod dock | What Hi-Fi? It's only 8.3cm deep, has touch-sensitive controls and can be wall mounted or placed on its matching stand. The stereo speakers have neodymium tweeter magnets to deliver "rich, powerful sound", says Pioneer. An infra-red remote control comes as standard, and a component video output means you can view video from your iPod or iPhone on a TV. The unit will charge any docked iPhone or iPod. "The latest addition to the Kodo range perfectly combines flexibility with superb sound," says Dominic Feeney of Pioneer GB. See our special blog for full details of Pioneer's 2010 product range.